A fine finale, which more than makes up for the failings of the first DLC and tells a great side-story of its own. There's little chance Daud and Corvo would ever have been friends. One's an assassin who killed an empress, the other's a bodyguard who failed to protect one. Two inherently opposing forces, with blood and Outsider marks on their hands. Put them in a room without bladed weapons though, and they'd find they had a lot in common. 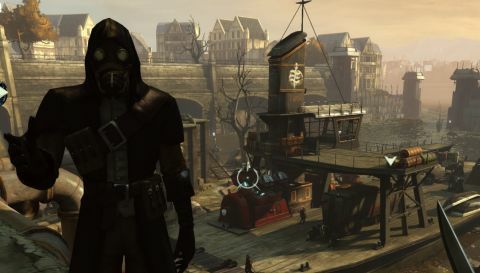 Corvo is fighting to redeem himself in the eyes of the city. Daud accepts his damnation, and is just shooting for a little personal redemption. Both men get their chance. As with the first part of the DLC, The Knife of Dunwall, playing as Daud feels immediately familiar but just slightly different. He has most of Corvo's powers, plus a few extras such as summoning assassins to take out targets for him, and the ability to call in favours from his underworld contacts. More importantly, he gets a moral flexibility that Corvo lacked. Playing the former Lord Protector, ghosting felt like the 'right' approach. Playing Daud, that's still possible, but helping to feed hungry corpse-rats or deciding “Nah” to a fiddly looking puzzle simply feels more appropriate. His continued mission is to track down Delilah: a Brigmore Witch who lives down a dangerous river – a Brig over troubled water, if you will. It's broken down into three missions, one re-using the prison from Dishonored , one set in Dunwall's garment district during a gang war, and a final one in Delilah's dilapidated mansion full of shrieking, rose-wrapped witches, living statues and other horrors. All are excellent. The first DLC started strong and then lost steam with a bland second mission, a boring, combat-heavy retread of the Flooded District, and absolutely no payoff. Each part of this finale however has a distinct theme and vibe we haven't seen before, catering to both combat and stealth approaches, and Daud confirms himself as a more interesting character than Corvo ever was. As with the main game, much of what's good about it comes down to the details – the ability to buy Daud a uniform to go undercover in the prison for instance, or an elderly godfather's reaction to you killing his nurse in front of him. The levels are packed with secrets, documents and general things to discover, and while most of the favours Daud can call on are a little boring, the ability to continue a save or get a ton of points up front means he gets to cut loose from the start. The one disappointment comes in a cameo by Corvo, in a scene that frustratingly relies on Daud's chaos level rather than – cough – a certain rather important decision made during Dishonored's campaign to decide how the story ends. That aside, this DLC sends the game out in style. It's more of the same, where 'the same' refers to quality rather than rehashed content – an honourable end, by even the Outsider's ambiguous standards.